Well, persistence pays off ;-) Yesterday was the first time that I won the monthly POTY (picture of the year) competition with my picture Pandora opened her box. The POTY is the monthly competition of the IMAGES international photography club and the theme this month was Hidden Treasure. There will be a winner of the year, too, but that&apos;s another story. So, how was the picture made? First of all, I needed a box. At home, I could not find anything suitable. So, I went to Blokker to look for a box to be used among the Christmas decoration. All I could find was a very ugly thing with a kitschy picture of Marilyn Monroe on top! Horrible, but cheap and usable for my purpose. I got this thing for around €4 and cut a hole in the bottom. Then I needed to have the red light come through the hole in the bottom and fix the box sufficiently high. After a few attempts, it appeared that a couple of Nespresso boxes would help - they had the right size to insert the SB900 flash with a red gel and a snoot. The blue light came from another SB900 with blue gel and a bowl diffusor attached. The box needed to stay open, which was achieved with part of a paper clip. 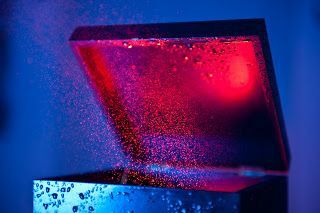 Of course, coloured light is not visible as such, so I used a spraying device to spray tiny water droplets to be lit by the flash. It took a couple of attempts to experiment with the right positioning, lighting and timing of the spray and shutter release. Both flashes were triggered wirelessly by the built-in flash of the D700 using the standard Nikon Creative Lighting System (CLS). Finally, shot 58 was exactly what I needed! It went to print without any retouching (except for removing the paper clip). Just an import and export as TIFF from Lightroom. Indeed, I&apos;m very happy that my idea worked out so well and that it was appreciated by the voters of the club.